After many years of considering the idea, we are finally installing a wood stove in our house. Given the regularity of power outages due to storms, a wood stove will keep us warm during loss of power, and we hope to rely on wood as a prominent source of heat, reducing our reliance on oil. Wood is a readily available, local, and renewal resource. We are collecting a bit of firewood from our own acre of woods, although mostly we will buy from reliable local sources. More on the firewood in my next post. The first phase of the installation was the hearth, once we decided on the location and type of stove. We opted to place the stove in the center of the house (a cape style), which required the removal of a closet. 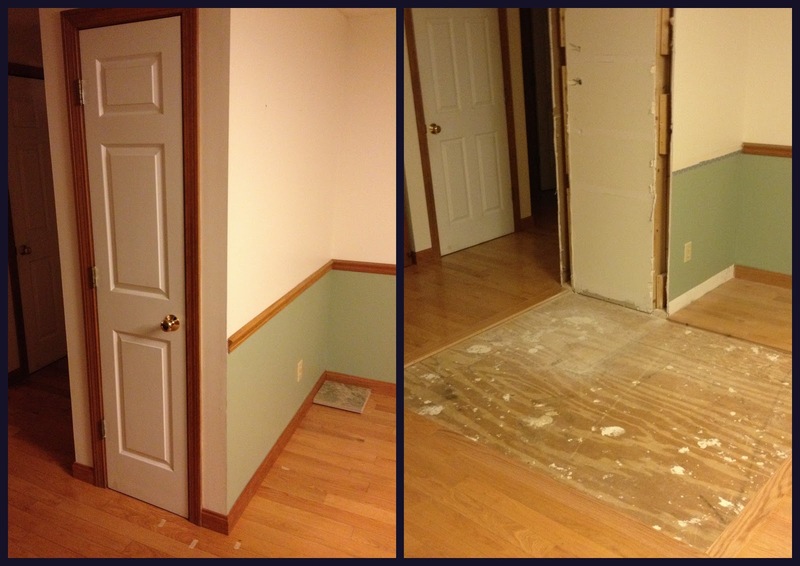 Here's the now removed closet and initial preparation of the hearth site. 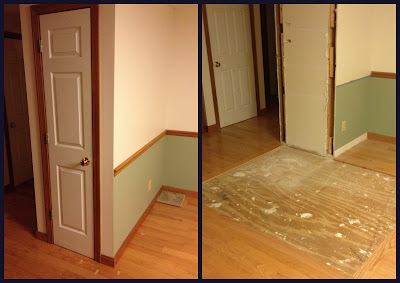 We hired a local carpenter who had installed some of our wood floors years ago. We chose a porcelain tile for the hearth. Picking out tile is like everything else: too many choices of color, size, and texture. We thought about a mosaic of tiles along the hearth border, but ended with a simple design of 12" x 12" tiles. Scott, our carpenter, framed the tiles with a strip of new oak flooring. Porcelain tile was recommended over ceramic tile for flooring. Supposedly it is stronger and more dense and has the color pattern all the way through the tile. None of which is necessarily true, it depends on the individual brand and style. The tile we chose--Floridatile Taconic Slate glazed porcelain tile--is strong enough to withstand a 450-pound wood stove. We assume. If you want a tile with the color all the way through the tile (so that if it is chipped it won't matter so much) then look for "through body porcelain," rather than the more common glazed porcelain. The use of tile for the hearth required an underlayment of fire resistant cement board. One common brand is called Durock. Scott used screws about every 6 inches to secure the cement board in place. This prep work took about 6 hours, then Scott laid the adhesive and the tiles. He used plastic orange spacers to maintain the 1/4 inch spacing between tiles. We let the adhesive dry for 24 hours before walking on the tile. Scott returned to fill the cracks with grout. 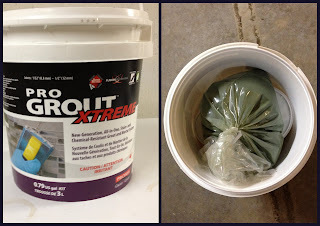 At Scott's recommendation we bought epoxy grout rather than sanded grout. Epoxy grout is best for high traffic areas and is waterproof. It is also much more expensive, but given the overall cost of the wood stove installation, the extra cost for good grout was worth it. Epoxy grout has three components: a base, an activator, and the color. Scott laid down the grout and we waited another day before it was finally dry and done! The hearth is 5 feet by 6 feet, which is a bit oversized. Given the required setbacks from the stove, and a bit of uncertainty on the exact placement of the wood stove until it gets installed, we didn't want to be undersized on the hearth. We've started gathering and buying and stacking firewood. I'll write about that tomorrow. For some, it seems to be a day for shopping. 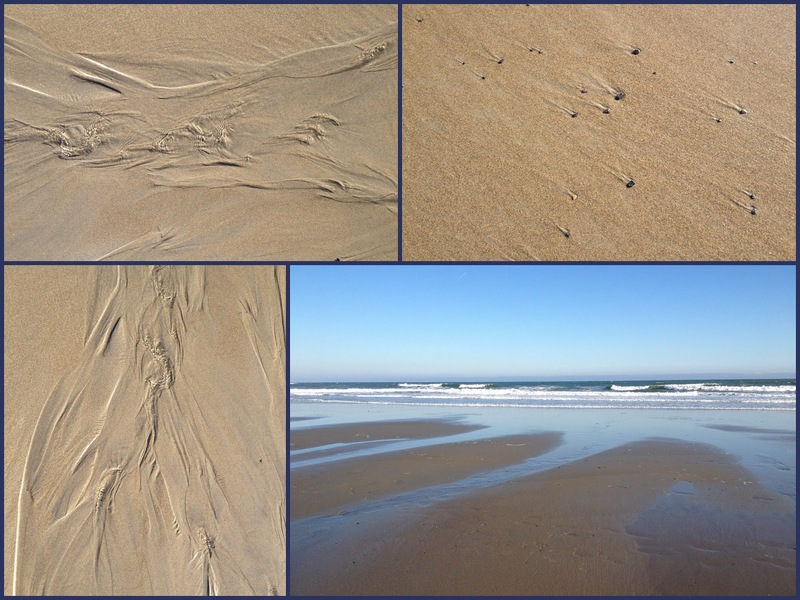 For us, it kicks off our return to the New Hampshire beaches in the off-season. 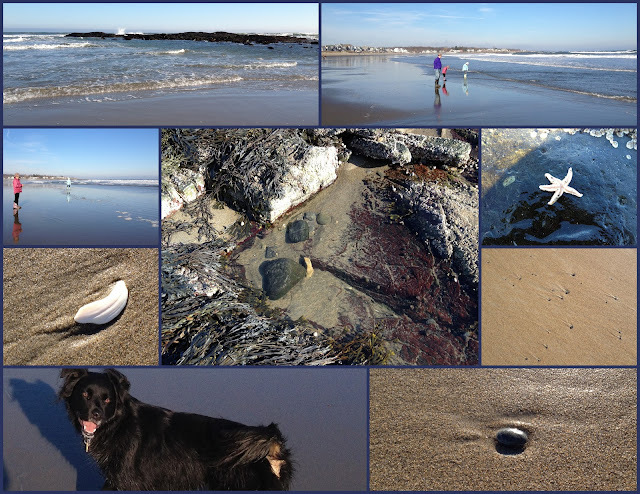 Today we visited the Rye Beach at low tide, a nice stretch of sandy beach for dogs to run, for kids to play at the tide's edge, for surfers to surf, and for some of us to enjoy the small stones, shells, debris, and sand patterns exposed by the receding waters. As we looked out to sea and explored the beach, we couldn't help but ponder the row of homes sitting just above the beach. Hurricane Sandy, if it had hit this far north, would have destroyed all those homes along this seashore. In time, I suspect such a storm will reach here. I'm glad we live 15 miles inland. We visit the beach when few others are there, including, it seems, the people that own those beachfront homes. My nieces and brother-in-law, visiting from Vermont, played at the tideline, while Srini walked Kodi down the beach in search of other dogs, and my sister and I looked for shells and stones. It is a lovely place to walk about and explore, not so good, I think, to own a home. It is a beautiful frosty Thanksgiving morning. All quiet in the neighborhood. We took Kodi to a town conservation area just around the corner for a morning walk--a few other dogs were out with their families so Kodi got some play time. The goldenrods and other wildflowers were coated in frost, a frost that will surely melt later this morning given the nearly 60 degree temperatures expected today. It promises to be a grand weather day, perfect for getting outside after the Thanksgiving meal. The air temperature has turned more seasonal--in the 40s during the day, below freezing at night. We've had a string of such days with bright blue skies and starry nights, after a warm start to the week on Monday. During our early morning walk we smell wood smoke wafting from our neighbor's houses. Two large deer hang from a tree down the road, harvested from the surrounding woods and hills by a neighbor and his friends. Local food for sure. It's been a few weeks since I peeked under my hoops and Reemay to check on my own local produce--the spinach, chard, beets, cilantro, and arugula in our garden. As I expected, it is growing slowly. Some if might not be harvested until next spring. Still, it is a thrill to see it growing so well under its cover. The Reemay allows sunlight and water through, while protecting the plants from wind and some of the cold. 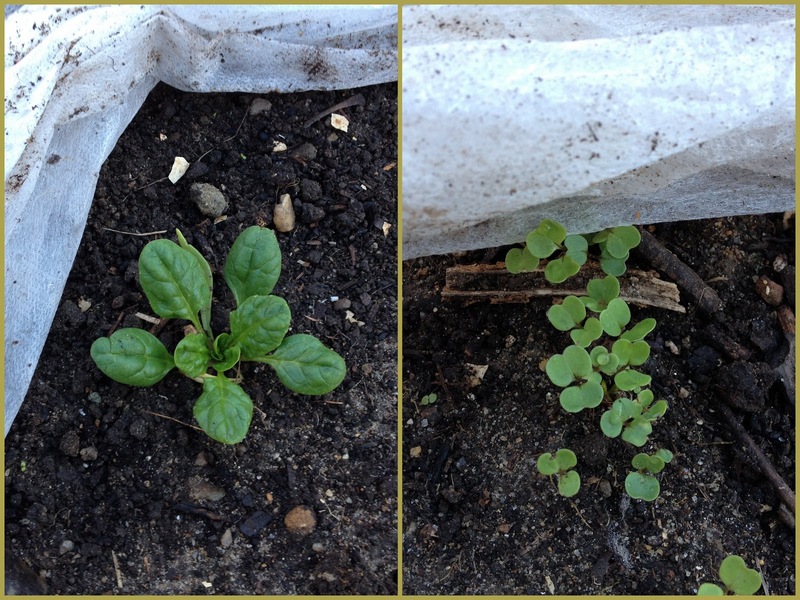 The spinach, chard, and beets are doing well under there, with no additional watering or other care. The arugula and cilantro, which I planted from seed, are also coming along. Here is the cilantro. I might be digging this out from under the snow in mid-winter, to add a bit of freshness to our winter fare. This is my first attempt at extending the gardening season into the colder months. So far, so good. It snowed about three inches overnight. Then we got sleet and rain and blowing wind. The sky is a dull gray. We are so fortunate that election day was bright and beautiful, as today's weather would surely have deterred some voters from going to the polls. Kodi on the other hand loves these raw days. He likes snow and wind. He sticks his nose deep into animal tracks, ones that I can see too given the snow cover. His tail and fur get tossed around by the wind. Although I'd rather stay inside with a hot cup of tea, Kodi insists that we venture out. Only after I'm bundled up and warmed by a brisk walk, do I begin to enjoy this raw November day too. Still, I'm happy to now be back inside with my hot tea as I watch the driving rain from my office window, with Kodi curled up on a chair behind me. We wake early these days, our internal clocks not yet adjusted to the fall back of time. Today seemed like a good day to rise early. It's election day and the weather forecast was perfect for our neck of the woods. Before dawn we walked with Kodi, the stars bright overhead, the air crisp, the temperature 24F. It felt good to be alive on such a morning. I voted at 9:00 am, along with many of my fellow citizens, then Kodi and I headed to our favorite haunt--the Sweet Trail. We almost always have the trail to ourselves during the week, no other humans that is. Today a raven flew over the trees, beautiful in its black feathering, flying swiftly on strong, graceful wings, announcing its presence with a hoarse croaking. The sky overhead was clear and blue. The colder pockets of the wetlands still carried a sheen of ice from the overnight freeze. Mostly the wetlands remained open, the water was calm and reflective. I could see fresh twigs had been gathered at one end of the beaver lodge. Blue sky remained throughout the day. With little wind and the crisp, clear air, it was worthy of another walk in the afternoon. Kodi and I set off down the road, walking to a nearby conservation area. There the milkweed pods lay open to the wind, the last of the feathery seeds ready to disperse with the next gust of wind. 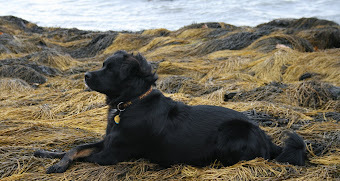 I await the election results with much anticipation and nervousness, but I know that tomorrow Kodi and I can visit the same open spaces to walk the paths, breathe the air, and listen to the birds, regardless of who wins. I was just thinking back over the month of October. Overall, it seemed fairly mild and yet we had a couple nights of frost, one small earthquake, and Hurricane Sandy (a tropical storm once it reached us). We lost power for two days because of Sandy, but no trees fell and no damage really compared to other storms of the past few years. The Halloween Storm of 2011 caused much more trouble, as did Hurricane Irene. No snowfall yet this season. 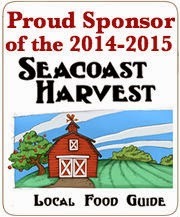 We planted our 520 cloves of garlic. Renee at New Roots Farm gave me some extra seedlings of spinach, Swiss chard, and beets. I've planted those under hoops covered with Reemay. I also direct seeded arugula and cilantro. Arugula shoots up almost immediately, so I already have neat rows of this favorite sandwich and salad green. Fall broccoli finally sported some heads in October, although I have yet to harvest them. My earlier plantings of arugula, Swiss chard, kale, and cilantro still look lush. 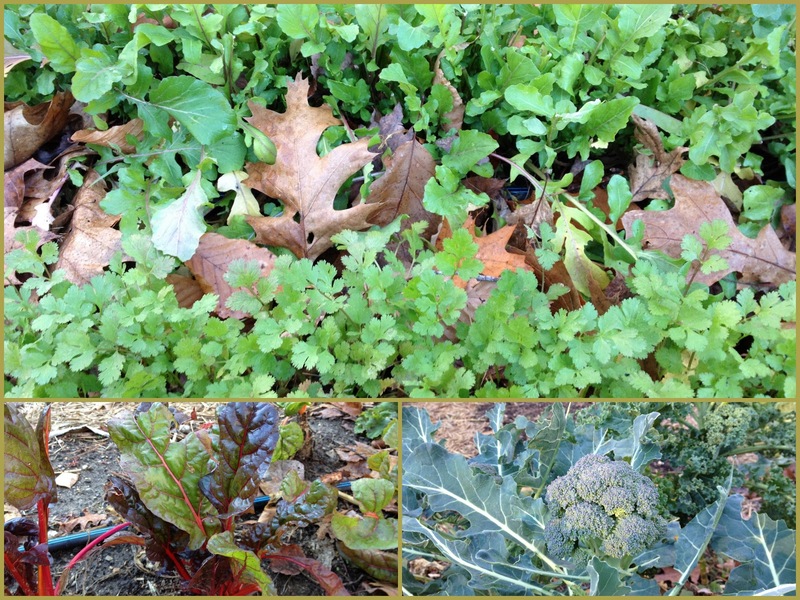 We harvested something from the garden every day through October and now into November. Salamanders and snakes and turtles remained active during October. Spring peepers seemed to be everywhere, and yet so difficult to track down. A spotted salamander made an unsuccessful attempt to cross a road in our neighborhood during last week's storm. Painted turtles were basking on logs and garter snakes were sunning themselves on sunlight paths throughout the month. Great blue herons and turkey vultures, both graceful in flight, are still around. In recent years, the vultures have tended to stay through winter as does a local flock of bluebirds. The National Weather Service says we're moving into a spell of colder weather, with several nights in a row below freezing. It is November and that feels about right.